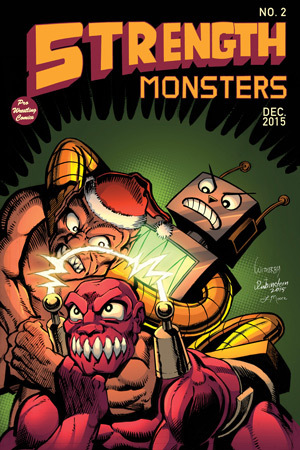 Rawking and Evil Robot find themselves suspended from Strength Monsters, the professional wrestling league that employees them. They are forced to take up temp jobs as Christmas Tree Delivery Men, and in a short time find themselves on a crazy adventure with Santa Claus (who is also a former pro-wrestler), his Elves, and a host of villains. If you liked Lobo's Paramilitary Christmas Special from the 1990s, you will definitely like Strength Monsters in Christmas Tree Delivery. Featuring Hulked up Elves, Pirate Santa Claus, lots of Christmas Trees and a host of Yuletide Craziness.